This is a wonderful verse with lots of wisdom in it, so even though I’m focusing on the principle of sowing and reaping don’t ignore the other nuggets of wisdom in the verse. Anyway…back to reaping better health. At least 4 times in the past 5 years I’ve gotten to the point where I could barely walk or have enough energy to do anything more strenuous then sitting in a chair thanks to various treatments for my brain tumors (NF2). Each time that’s happened, I’ve regained my health and my energy. Maybe not to the point that it was before the tumors and the treatments but more than enough to enjoy my life. Last October my feet went numb causing me not to be able to walk without assistance. The doctors decided it was a combination of the chemo I was taking at the time and the NF2. This was only the latest of setbacks to my health but it was certainly one of the worst–right up there with losing most of my hearing. Anyway, I’m so thankful to report that I’m almost back to my “new normal.” My energy is at a good level again. I can walk–yes I need a cane when I’m out and about but in my house I don’t need the cane. Though I do occasionally lose my balance and have to grab the nearest thing I can find. Spiritually and emotionally, I’m really good! If you want to reap better health, then you have to sow better health. 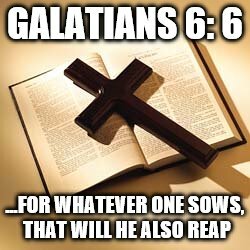 The Bible tells us over and over that we reap what we sow. In other words our actions have consequences. So if you want to reap better health then you have to start sowing or planting the seeds for better health. Want something more specific? Do what you can do. Whatever level you are at now, do what you can do. If that only means being able to walk around your house one time every hour, then do it. And then try to increase it in some way–it doesn’t have to be a lot but keep pushing yourself. Even when I couldn’t walk alone I would try to exercise at least 3-4 times a week. I would use the treadmill and hold on and then I might only be able to walk 5 to 10 minutes–very very slowly. But then I would increase the speed just a bit and then a bit more. When was doing my stretches and balance and strength training, I had to sit in a chair at first. And then I would stand by the chair and hold on to it. It was only a week or so ago that I moved the chair out of my exercise room. Eat healthy. I’m not saying you have to go overboard with this but…the healthier you eat the better you’ll feel. It’s like an old computer saying–junk in; junk out. I think the same can be said for our bodies. Keep your eyes on Jesus! God will be faithful but only if we keep our faith. If we become negative, bitter, and angry, or even depressed and give up then you won’t see the fulfilment of God’s promises in your life. So how do you keep your eyes on Jesus? Renew your mind daily with God’s Word. I have tons of Bible verses written on index cards. I read them and reread them. As I do, I feel my faith strengthened and my spirit renewed. God’s Word is supernatural and has healing power. Pray–pray–pray. Stay in contact with God as often as you need to. Feel yourself being drawn to a pity party? Pray to God for peace and joy instead. Praying doesn’t have to mean long drawn-out sessions, a prayer can be a sentence or two. Praise & Thanksgiving. Every time you feel the negative emotions coming, you can chase them away by praising God and being thankful for all the good he’s done for you. And no matter what your situation is, you can find the good–if you look for it. So there you have it. These are some of the things I’ve done to get to a better place in my life after yet another health setback. And even though, I’ve been talking about physical setbacks and how to reap better health, I believe that these principles will hold true in any situation. YOUR TURN: What do you do to reap better health? Some things to think about. Wonderful to hear you are doing better. Keeping you in my prayers. Thanks, Ann. It’s so wonderful to feel like myself again.